After my trip to Croatia last month (wow, has it only been a month? 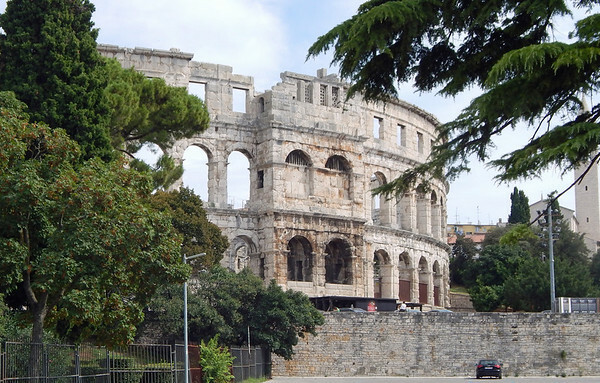 ), I can now claim that I’ve been to three Roman amphitheaters. 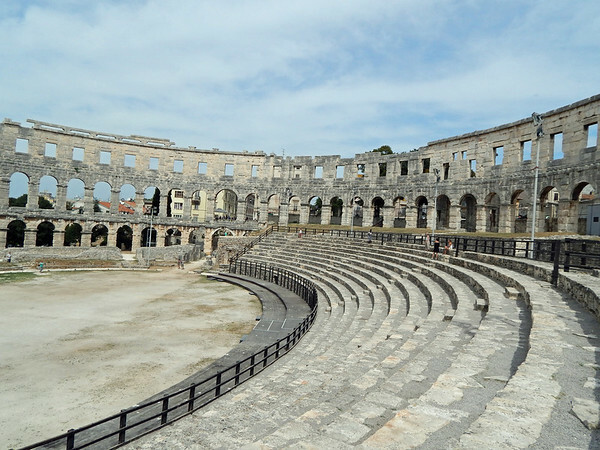 Archeological research has found signs of Homo erectus going back to possibly 1 million years in Pula, on the southernmost point of the Istria peninsula. 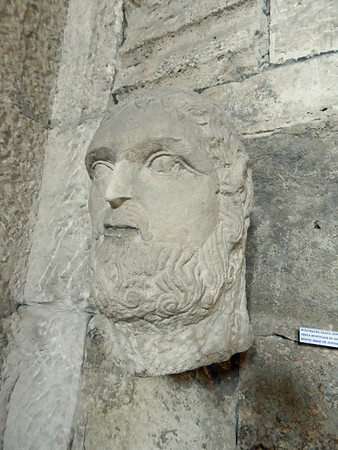 The city itself was founded about 3,000 years ago, has records of human settlement from 8000 years ago, as well as early Greek occupation long before the Romans arrived. 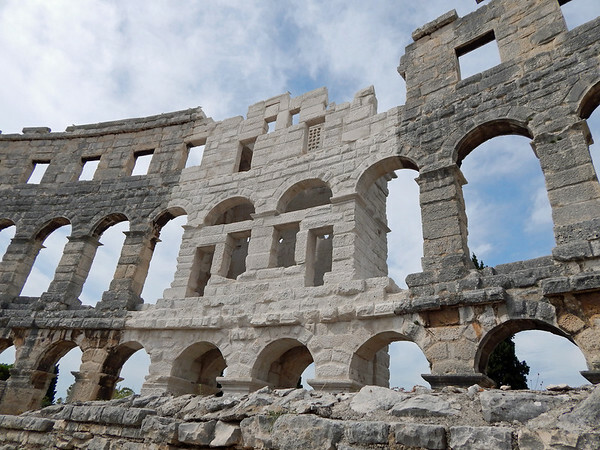 The Romans made Pula a center of shipbuilding, fishing, wine-making, and olive oil production. The Emperor Vespasian commissioned the amphitheater, which is the sixth largest still standing, and held up to 20,000 spectators. Elaine and I spent part of our day climbing over the amphitheater ruins in the central part of this small city of 63,000. 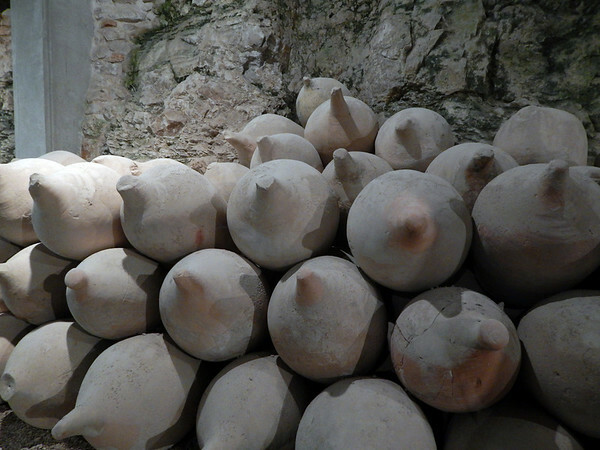 In addition to the amphitheater, a mock-up of an olive oil factory, where the oil was purified and loaded into ampoule jars, is located underground. 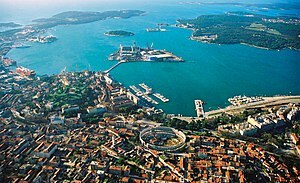 The arena is the site of the Pula Film Festival, held each summer. 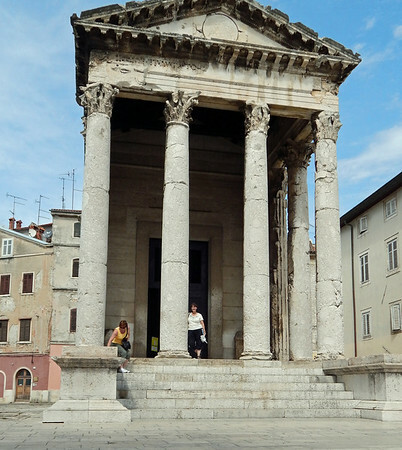 In additional to the arena, other Roman monuments which are easily accessible in the city are the Temple of Augusta. This was destroyed during Allied bombing runs during WWII, but was rebuilt from the rubble and houses architecture and sculpture from the Roman period. The temple is located in the center in the old Forum which now, as then, is part of the central plaza. 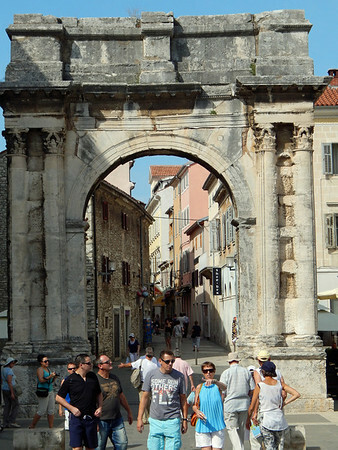 Part of the arch also remains, dated to 28 BC. Unfortunately, the Archeological Museum was closed for renovations, so I can’t report on it. Aha! Lynn and I have been there, Naomi – it’s a fascinating place! OH, I didn’t know that! I’d like to see how they accomplish the rink!